Some readers unlucky enough to not have any trips to York or Sheffield planned (more fool you!) may be pleased to know that this is a little interlude from that particular tale. As you may be aware, I am particuarly partial to darker styles and in my humble opinion Bristol Beer Factory make a fine stout at the best of times. They’re so good that at Christmas my partner and I couldn’t resist treating ourselves to their Twelve Stouts of Christmas which is a great way to try their regulars as well as some special editions. Unlucky for you, this here bad boy is an extra-special edition. 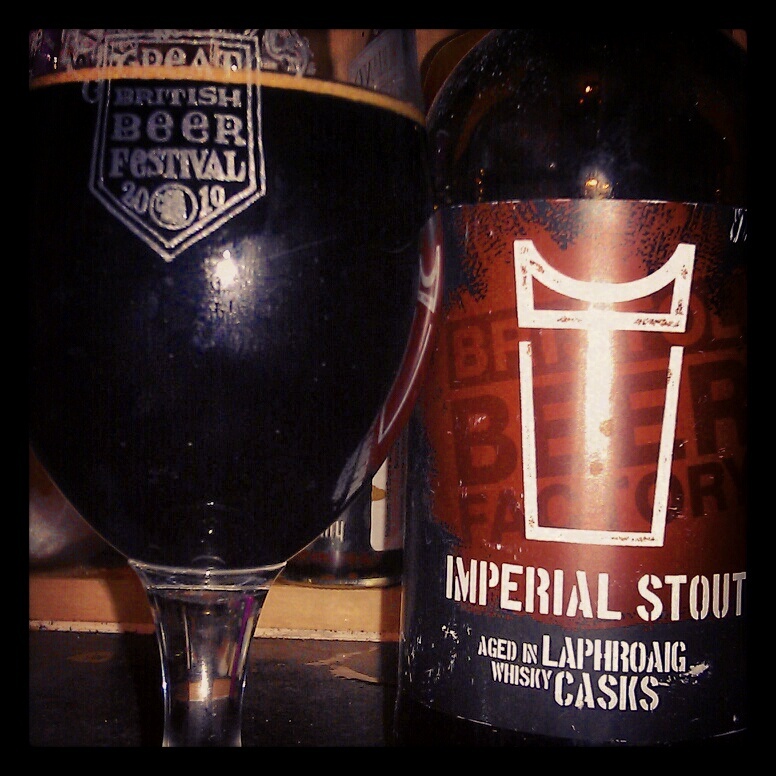 Imperial Stout aged in Laphroaig Whisky Casks (9%ABV). Innis & Gunn – you’re toast. We had good times but this stuff is the real deal. This is what happens when you take an already exceptional stout then age it in the oak casks from an exceptional whisky. The ideal Friday evening treat to cozy up with and round off this wet and wintery week. Whisky in the jar? I'd rather have some of this yummy stout thanks! The strange thing is, although I know from my whisky-loving companions that Laphroaig is the schizz, I am in no way a whisky drinker. My partner had a bottle a while ago which he savoured and loved but for a warming spirit, I go with rum every time. I did try some a couple of times, but it was just too smokey, too much. The aroma of this stout brings it back vividly; on a blind test, I’m not convinced I could even identify this as a stout, or any other beer. It just smells of Laphroaig. I guess it’s expected since the Stout was aged for six months in oak casks previously used for Laphroaig’s 10 year old whisky. As I’ve come to expect from Bristol, this is a proper, almost black as night stout, opaque and so thick you can roll it around in the glass and watch it coat the sides. The flavour is intense, complex, voluptuous, full. It remarkably maintains the character of the stout with velvety notes of chocolate and takes on the oaky smoke of the whisky, combining to create a deep dark roasted old brown java crescendo finish. You’re quickly left with a slightly dry boozy mouth which makes you long for the next sip. I really hope this makes a re-appearance at some point, but if not I am still super excited that Bristol will be putting together another twelve stouts this Christmas! Only another 8 months to go! For now, I’m looking forward to catching them at Grillstock, the ultimate celebration of barbeque, beer and hick music. I’m pretty sure last year I was their first customer. Who’s going this year?